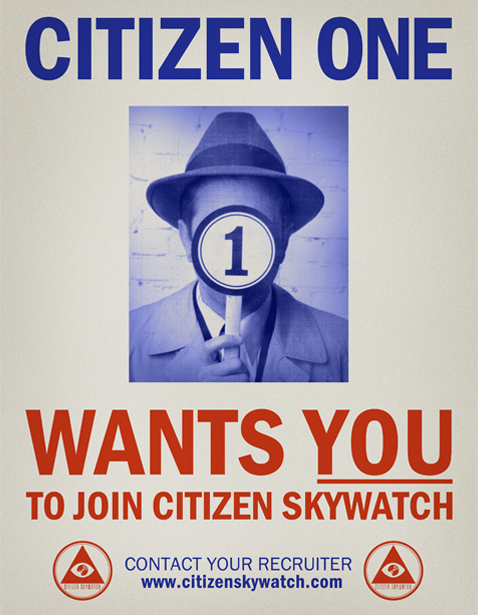 CitizenSkywatch.com starts out by letting us know that the invasion has begun and that Citizen One wants us to join in the fight. You can tell Citizen One from all other Citizens because instead of an actual face, his head sports a giant number 1, which seems very unhuman to me. Maybe Citizen One is really an alien from Planet Numbers and is trying to get us to wage a war against the 26 species of Planet Alphabet (whose faces would of course sport giant letters). If we are practicing due dilligence, then we must at least entertain this idea that we could be helping Citizen One perpetuate inter-species genocide. OUR SKIES ARE FILLED WITH THE SHADOWS OF AN ENEMY UNKNOWN: ITS ORIGIN IMPENETRABLE, ITS PURPOSE INSCRUTABLE, ITS METHODS -- INCREDIBLE. THE TRUTH CANNOT BE DENIED... YET OUR DEFENDERS DENY IT. THE MENACE IS BEYOND BELIEF... YET WE MUST BELIEVE IT. We are a small but growing army -- forced, by circumstances, to grow in secret. Make use of all these resources. Citizen 19 in our Northern California field office reports rapidly developing events near Red Wind, California. Area residents have observed an aerial phenomena. These phenomena were noted by two CHP officers during a two hour period. The County Sheriff's Dept. 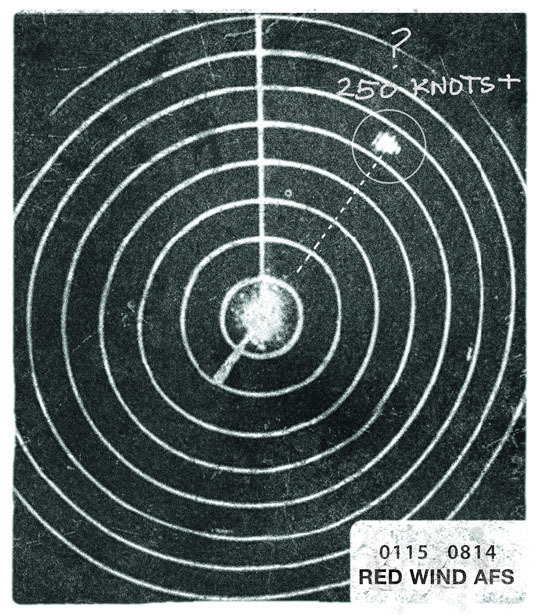 apparently also checked with Red Wind Air Force Base, which indicated RADAR confirmation of the unidentified phenomenon indicating an unnaturally rapid, straight-line trajectory. If true, this could represent a major breakthrough given eyewitness report by official witnesses and apparent physical confirmation. This incident conforms with previous reports of inexplicable weather activity suggesting an artificial or paranormal source. However, we should leap to no conclusions. This field of study has been rife with misinformation, disinformation, mistaken observations and intentional hoaxes. Until *ABSOLUTE CONFIRMATION* from Headquarters that a given incident fully conforms to the evidentiary model, regard all reports with suspicion. 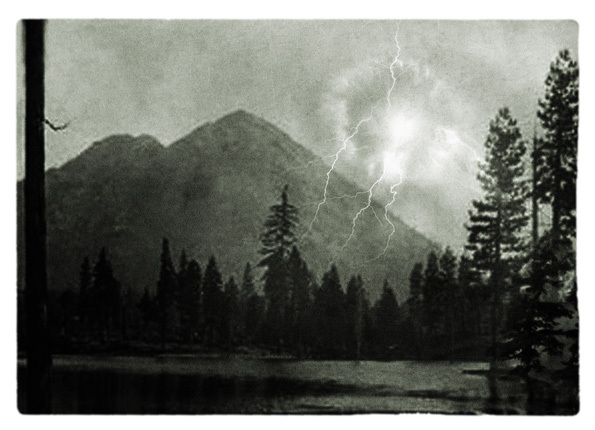 Recent reports of the sighting of a bizarre isolated electrical storm by California Highway Patrolmen provided what appeared to be one of our best-supported incident reports in recent months. However, early suggestions of RADAR confirmation by an Air Force base were undermined by official denials. Local police have been denied access to the radarman involved. However, a confidential source has provided what may be confirmation in the form of a RADAR report suggesting that the concentrated storm event moved in a direction and speed suggesting controlled influence. This information is still under review. Citizen 19 was eventually able to put together this timeline of events in Red Wind. 11:00 PM: County police reporting isolated dust devils over scanner. We may be your neighbor, your greengrocer, your milkman, the reporter on the beat, the housewife on her rounds, the bright-eyed student seeking greater purpose or the seasoned veteran longing to impart his skills to a waiting generation. We are everywhere and nowhere. Citizen Zero is my right hand and her word is to be regarded as my absolute authority. (Hence, designation Zero: this indicates that she filters all information that comes before One.) Through her, I have been passed certain comments and information. You are prepared to act. Yet you remain unclear what you seek. We must maintain awareness of any unexplained or so-called “paranormal” phenomena. It is true that the vast majority of such reports are hoaxes, delusions, misinterpretations or the results of technical failures or simple human error. There are many who would quickly dismiss all evidence as false. We must disregard these voice. We must question their motives. And above all, we must be prepared to preserve all information -- no matter how seemingly meaningless and insignificant -- while we decrypt, decode and analyze every scrap of material that we obtain. We have been receiving some preliminary analysis from Citizen Soldiers around the country - both calling out incidents that they believe could be correlated to those we are currently investigating and researchers who are helping analyze the scant evidence we have collected thus far. Citizen Japester reports in "The lightning storms here in the Midwest can interfere with the radio and even with the television. But these new disturbances are a whole new ball of wax. I've never seen anything like it. The television changes channels on its own, and the radio starts spewing out static (it almost sounds like a language...). The incidents are happening more frequently now, and at regular intervals. Last night was the worst. Every fuse in the house blew at once. This is bad." Citizen Theta Sigma submitted this interaction with law enforcement in the Midwest: In a chat with a local law enforcement I was able to inquire about phenomena I was hearing about from other Citizens, to my surprise he said one night there was a rustle in the office and a select few went out to check on the situation. After there return the man approached them with the question "What going on" the man replied "Just a scare." Personally I don't think there would be so much commotion for something that has the potential to be just a "scare." Citizen Soldiers, it is footwork like this that will bring the truth to light and uncover any plots against this country. The Citizen Elite are digging into these incidents to validate their authenticity and to ascertain the credibility of the threat and determine the likelihood of a hoax. 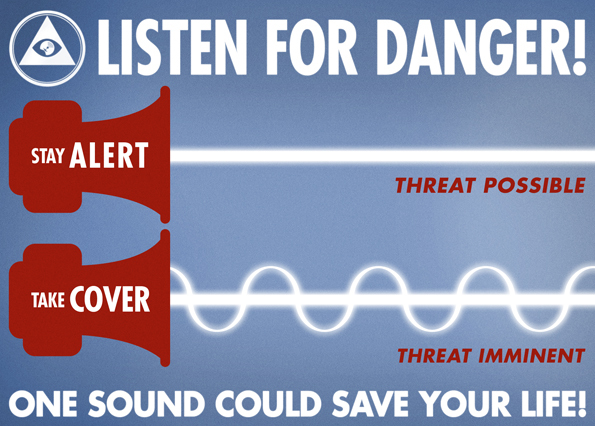 Any other disturbances you see should immediately be reported - with or without visual, auditory, or physical evidence. Good work, men. ITEM! Recent aerial phenomena -- are they caused by visitors??? In addition to Red Wind etc., more events *just* came in. doutb "who" is causing this? witnesses! We count 14 police officers, plus postmaster. its energy and connection with Lemuria / Mu! Has anyone else heard about the "strange people"
"shapeshifting" figures. Let us know!! at Mount Shasta location. TONIGHT! Bring telescopes, camarasand lots of COFFEE!! CONTACT YOUR AREA N.U.F.O.S. REP. FOR MORE MONITORING EVENTS! LET'S NOT MISS GETTING PROOF OF THIS MAJOR "FLAP"!!! *channeled material* from Venusian Nordic mystics. We have enough skeptics in the gov't and press! Do we need *more* among supposed allies? NEXT MTG - SEPTEMBER! DATE & LOCATION TBD. USE THE PHONE TREE! “Atmospheric phenomena continue in Northern California. 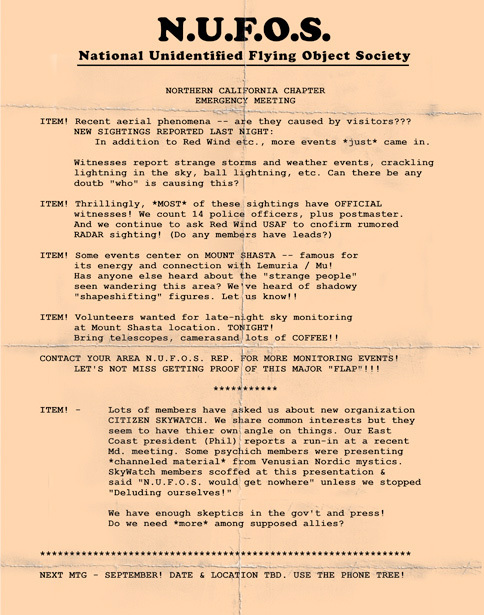 I attended a Northern California NUFOS ‘emergency meeting’ and obtained some new info -- see attached. In the face of unprecedented phenomena, other groups have arisen to cope with the tidal wave of data, disinformation and ungrounded conjecture that have flourished in the shadow of official denial. We cannot expect that all of these groups will examine the evidence with the rational discipline and dedicated thoroughness of our Citizen Soldiers. However, from time to time, we may examine their evidence in an attempt to cull reality from rumor and fact from fantasy. N.U.F.O.S. seems determined to tie the bizarre weather phenomena to the panic about so-called “flying saucers”. As we know, government sources disproved most of these sightings. A relatively small handful of such events may be connected to the phenomena that we have been tracking. 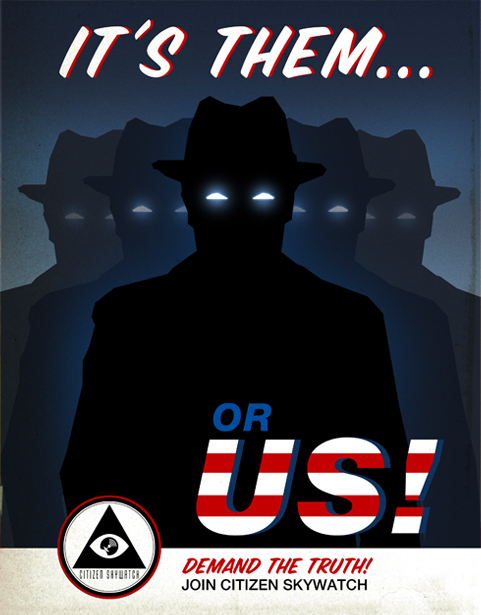 However, we do urge members to make note of the reports of mysterious shadowy strangers mentioned in the N.U.F.O.S. report. This conforms to previously reported events and suggests that we may be dealing with agents of an unknown foreign power responsible for instigating these atmospheric attacks. A recent wave of phenomena have occurred in Northern California. Bizarre atmospheric and weather effects suggest a controlled experiment or attack. Despite confirmation of a sequence of these phenomena by police personnel, the military denies RADAR confirmation. First spotted in the Mount Shasta area, they may be connected with an incident near the Oregon state line. Citizen 13 advises us of bizarre meteorological activity in the Seattle area. This cluster of phenomena suggests an imminent convergence, possibly in as little as one week from today. Stay alert, especially if you plan to be in Washington State before next weekend. Mobilization will be implemented under the codename: Operation Papa Alpha X-ray. 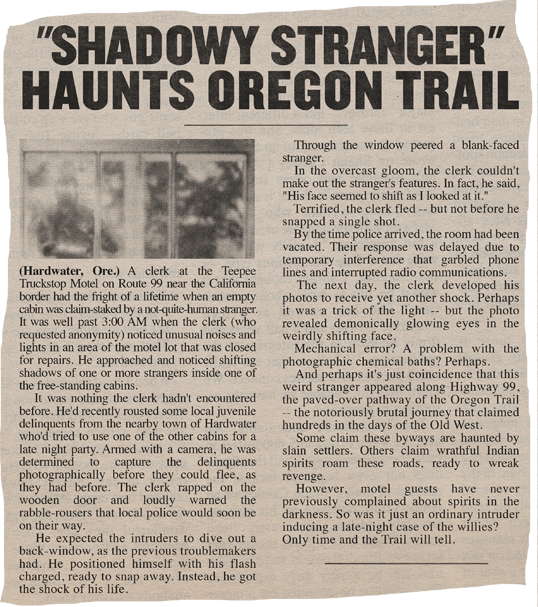 (Hardwater, Ore.) A clerk at the Teepee Truckstop Motel on Route 99 near the California border had the fright of a lifetime when an empty cabin was claim-staked by a not-quite-human stranger It was well past 3:00 AM when the clerk (who requested anonymity) noticed unusual noices and lights in an area of the motel lot that was closed for repairs. He approached and noticed shifting shadows of one or more strangers inside one of the free-standing cabins. It was nothing the clerk hadn't encountered before. He'd recently rousted some local juvenile delinquents from the nearby town of Hardwater who'd tried to use one of the other cabins for a late night party. Armed with a camera, he was determined to capture the delinquents photographically before they could flee, as they had before. The clerk rapped on the wooden door and loudly warned the rabble-rousers that local police would seeon be on their way. He expected the intruders to dive out a back-window, as the previous troublemakers had. He positioned himself with his flash charged, ready to snap away. Instead, he got the shock of his life. 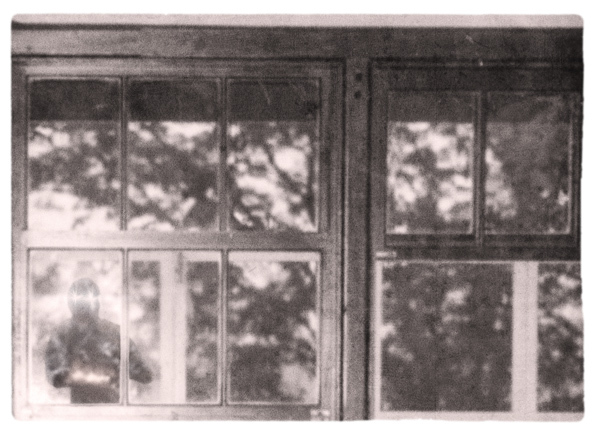 Through the window peered a blank-faced stranger. In the overcast gloom, the clerk couldn't make out the stranger's features. In fact, he said, "His face seemed to shift as I looked at it." Terrified, the clerk fled -- but not before he snapped a single shot. By the time police arrived, the room had been vacated. Their response was delayed due to temporary interference that garbled phone lines and interrupted radio communications. The next day, the clerk developed his photos to receive yet another shock. Perhaps it was a trick of the light -- but the photo revealed demonically glowing eyes in the weirdly shifting face. Mechanical error? A problem with the photographic chemical baths? Perhaps. And perhaps it's just coincidence that this weird stranger appeared along Highway 99, the paved-over pathway of the Oregon Trail -- the notoriously brutal journey that claimed hundreds in the days of the Old West. Some claim these byways are haunted by slain settlers. Others claim wrathful Indian spirits roam these roads, ready to wreck revenge. However, motel guests have never prevoiusly complained about spirits in the darkness. So was it just an ordinary intruder inducing a late-night case of the willies? Only time and the Trail will tell. A new article offers additional context on recent mysterious photo evidence, but the source is considered highly unreliable. This sighting may be tied to the mysterious strangers sighted in Mount Shasta and adds credence to our conjectures re: next-generation camouflage technology. These mysterious figures really seem to get around. One was also spotted at the American Stonehenge in Maryhill, Oregon (or Washington if you want to be correct). Witnesses reported someone crawling along the top of the slabs after hours possibly trying to figure out the purpose of the structure. (It's actually a monument to soldiers who died in World War I.) 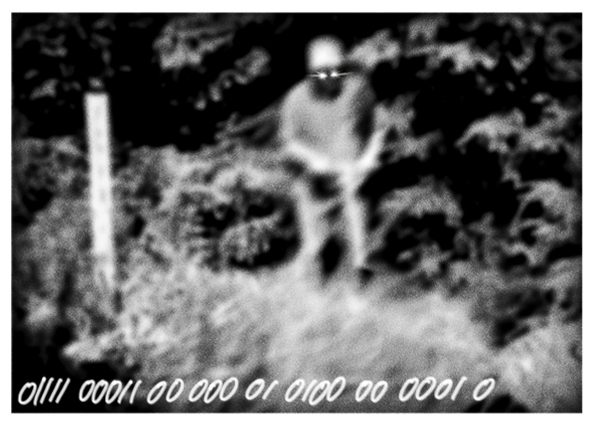 The witnesses were able to get a photograph of the individual, although afterwards, the figure started staring in the direction of the witnesses even though they were hidden in the dark. As there was 300+ miles between occurances on the same night, it's a bit doubtful that they were the same individual, unless they have a better transportation system then we do. The convergence of strange phenomena in Washington State appear to be building to a head. We are tracking reports of lightning bolts of a clear blue sky -- static / interference on radio, television, etc. related to intermittent and unexplained lighting activity. Patterns seem to be circulating -- focusing on area near the Convention Center. Previous reports around the country suggest that these are all hints that something BIG is going to hit. Let's be ready. Friday, Aug. 26 -- I want all hands on deck. If you'll be in Seattle then... be prepared!" 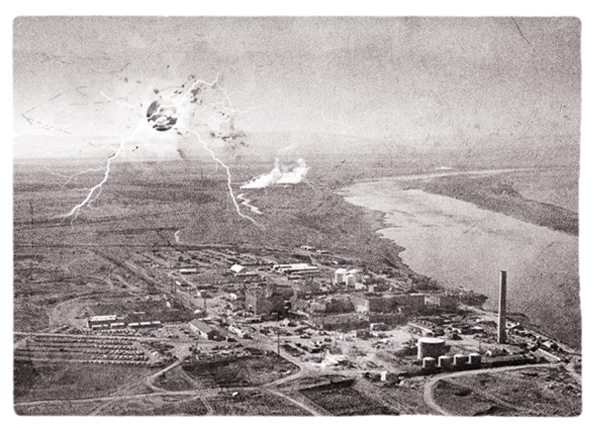 "Nuclear facility near Richland appears to have suffered a breach related to strange phenomena we've encountered. Isolated electrical storm. Possible breach of facility by unknown strangers. We are attempting to obtain additional information and/or surveillance photos." Tracking recent phenomena suggest coordination towards the point of accumulating weather activity in the Seattle region. Anyone in Seattle this weekend is urged to check in at our local Recruiting HQ ASAP. The Recruiting HQ is temporarily located at the Convention Center with office hours beginning 10 AM Friday. Maintain vigilance. Operation: Papa Alpha X-ray is imminent. *BREAKING* - HANOVER SITE SABOTAGE? The West Coast phenomenal convergence continues, with a trajectory suggesting imminentdevelopments in Seattle. "Reportedly AEC Security reported seeing 'shadowy figures' in breach incident. The figures were observed studying the reactor technology. The report is consistent with other evidence indicating the movement of unknown strangers behaving in furtive ways, often in areas that have suffered from inexplicable and isolated weather events. Following the alleged breach, AEC personnel were investigating possible sabotage / damage to reactor face. 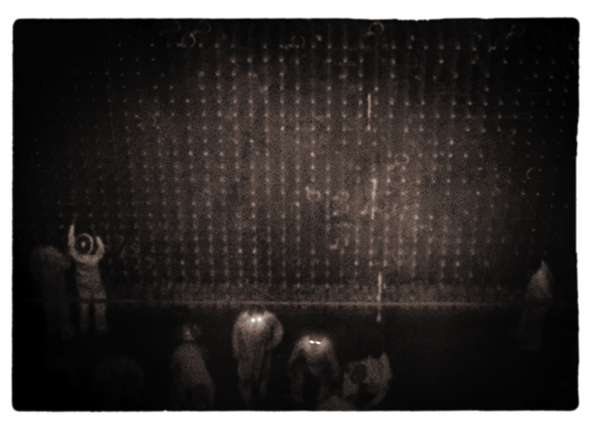 Some analysts suggest that the damage to the reactor may have been an accident resulting from experimental testing by these intruders. 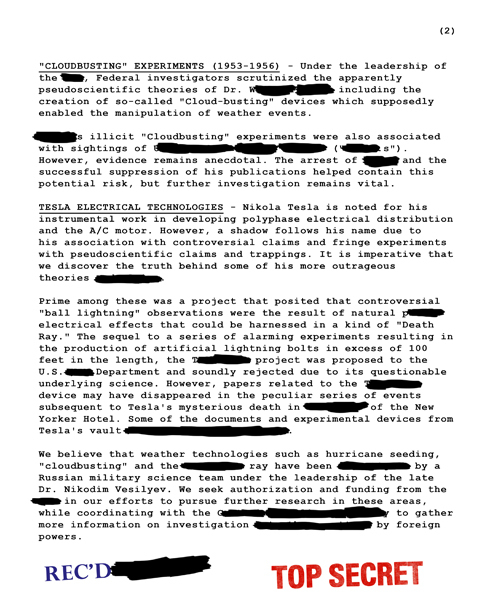 Citizen SkyWatch analysts have proposed that Soviet agents may be testing "weather weapon" technology resulting in controlled lightning activity. Damage to the reactor is consistent with this theory." Phenomena appear to be moving northward. Seattle area personnel are on standby for Operation Papa Alpha X-ray. The West Coast phenomenal convergence continues, with a trajectory suggesting imminent developments in Seattle. "As predicted, the weather's getting weirder up here. And that's not all -- apparently some strange visitors have been poking around the area. Reports of trespassers at the power station and phone company... and Navy sailors chased off some weird ducks eyeballing the shipyards. If we play our cards right, we might be able to get our hands on one of these weirdos." 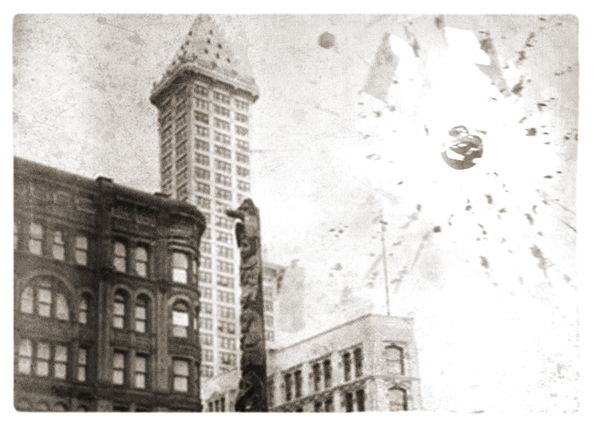 Now, new photographic evidence has been obtained by Citizen 13 indicating a recent bizarre atmospheric phenomenon in Seattle, once again suggesting controlled experimentation. (Note: the veracity of this evidence has not been confirmed). Operation: Papa Alpha X-ray is imminent. Report to Seattle Recruitment HQ at the Convention Center this Friday. 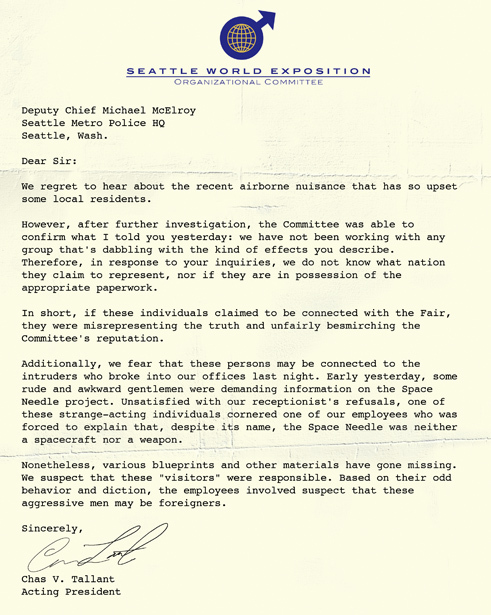 A vital piece of information has surfaced that may relate to Citizen 13's investigation in the Pacific Northwest. Please review this material and discuss. ITEM! Did you hear about the strange storm downtown yesterday? A local secretary snapped a shot of the brief but dramatic lightning strike, and her wild tale of weird weather in the sky was backed by fellow workers. It sounded like the most mysterious airborne whatsit spied in these parts since the notorious Maury Island Mess of '47. Alas, a few eyewitnesses have surfaced to claim that the seemingly super-natural event was entirely ordinary. According to local residents, some quite human visitors in dapper black suits were meddling with complicated equipment in the back of a panel truck. 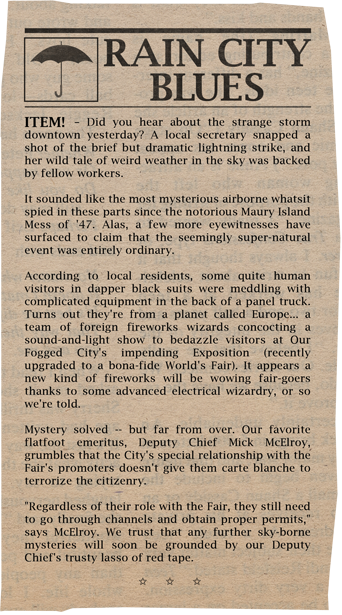 Turns out they're from a planet called Europe... a team of foreign fireworks wizards concocting a sound-and-light show to bedazzle visitors at Our Fogged City's impending Exposition (recently upgraded to a bona-fide World's Fair). It appears a new kind of fireworks will be wowing fair-goers thanks to some advanced electrical wizardry, or so we're told. Mystery solved -- but far from over. Our favorite flatfoot emeritus, Deputy Chief Mick McElroy, grumbles that the City's special relationship with the Fair's promoters doesn't give them carte blanche to terrorize the citizenry. Regardless of their role with the Fair, they still need to go through channels and obtain proper permits," says McElroy. We trust any further sky-borne mysteries will soon be grounded by our Deputy Chief's trusty lasso of red tape. Operation Papa Alpha X-ray is imminent. group that's dabbling with the kind of effects you describe. a spacecraft nor a weapon. Nonetheless, various blueprints and other materials have gone missing. aggressive men may have been foreigners. Citizen 13 has confirmed that enemy agents may be working in the Pacific Northwest theater, using a variety of cover stories. These individuals are not to be trusted. It remains unclear to what organization or foreign power cut these enemy agents owe their allegiance. We know that key evidence has been destroyed or "disappeared" in the past. We cannot allow that to happen again. 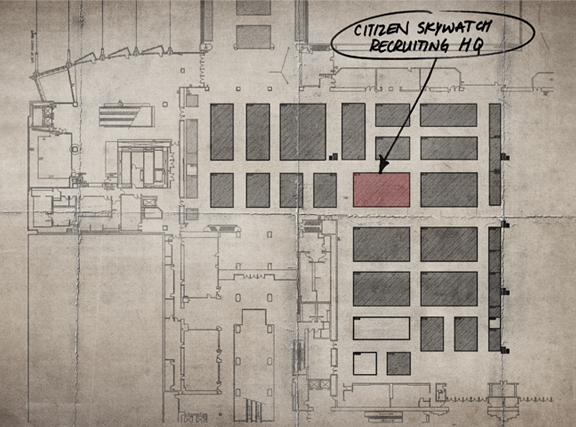 All available Citizen Soldiers are to report to Recruitment HQ at the Convention Center in Seattle. Prepare for possible mobilization later tomorrow evening approx. 6:30 PM PT. All personnel in Seattle Area are hereby ordered to check in at our Recruitment HQ (located within the Convention Center). Details will be issued for a meeting in the field to review troubling new evidence located by our local Citizen Elite representative, Citizen 13. Report to the Recruitment HQ as early as possible to be prepared for further developments. Observe security protocols and beware of hostiles in the environment. Operation P.A.X. started with Citizen Soldiers visting the Recruitment HQ inside the Convention Center. As they waited in line, many of them were questioned by Citizen Agents wanting to know if they were Communists or not. On the walls of the office were many pieces of evidence - some of which were taken directly from the I.D.D (which now have the red HOAX and the blue REMOVED FROM EVIDENCE stamps all over them). There was also a large blackboard with all sorts of writing on it (including some Morse Code that translates to LISTEN TO THE RADIO). Recruits eventually made their way into a medical room where they were again questioned, this time by a nurse and/or scientist. Some recruits were given Rorschach tests while others were asked their opinions on various pieces of evidence. 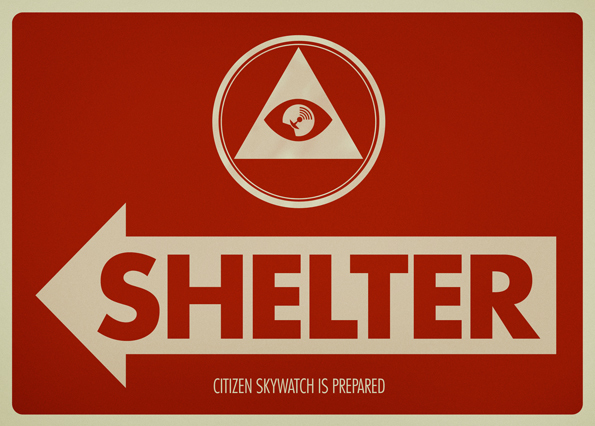 Eventually, recuits were asked if they wanted to join Citizen Skywatch. If they were, they were taken to another room, asked their name, city and technical speciality and given an ID card. The new recruits were also told to meet Citizen 13 at The Rock Bottom Brewery at 6:30pm to receive new information. Reports are a bit sketchy as to what exactly happened, but it seems there was some sort of police presence, a man was shot and this corpse was left behind. A video taken in the bar not long afterwards suggests that the man who was killed was Citizen 13. The next day, Citizen 13's body was moved near the Headquarters inside the Convention Center and new recruits were continued to be signed up. After the joined Citizen Skywatch, they were then told to go visit the 2k Games booth. At the booth, they were given either a blue alert card (which has a slogan on the back) or a red shelter card (with a QR code) and sent on their way. It's soon figured out that "the blue" refers to the blue Stay Alert cards while "the red" were the red Shelter cards given out at the 2k Games booth by saying "Citizen Zero sent me". Each of the blue cards was numbered 1 through 10 and contained a phrase. Each of the red cards had a QR code on the back that, when scanned, would compose a tweet numbered 1 through 10 and a long string of gibberish letters. 1b: There has been a change in the air. 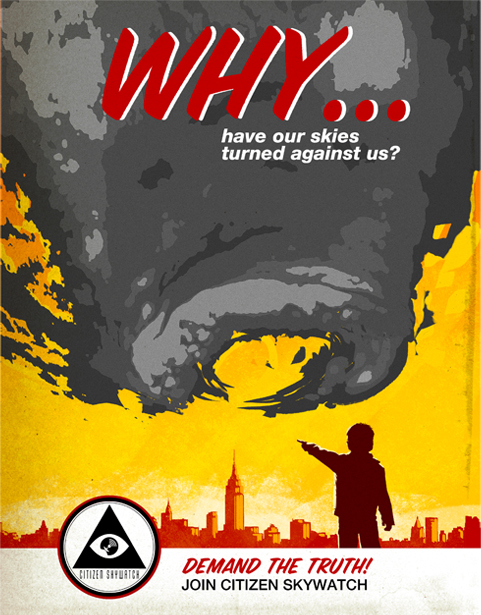 Our skies have become the weapon of an enemy unknown. 1d: Fellow Citizens - The mark I was tailing was an odd duck. Not sure whose side he was on. 2b: Seeing is believing. Authorities are deceiving. Trust your eyes -- not their lies. 3b: The enemy is among us. The truth will set you free. Denial will bring defeat. 4b: No censor can fully block the truth. This war will be fought behind headlines. 4d: But it seems as if there is more than one gang of black hats loose in Seattle. 5b: It's Them or U.S. We cannot save ourselves unless we save our country. 6b: Every eye is a spy. Every arm is a weapon. Every citizen is a soldier. 7b: what you don't know can hurt you. in a world of deception, the only defense is the truth. 8b: A little knowledge is a dangerous thing. More knowledge is a deadly threat to our ends. 9b: In this time of tribulation, silence is betrayal. Ignorance is treachery. Apathy is treason. 10b: Do not trust the Government. Do not trust the media. Trust only Citizen One. Fellow Citizens - The mark I was tailing was an odd duck. Not sure whose side he was on. But it seems as if there is more than one gang of black hats loose in Seattle. Note: The r: desginates a red Shelter card, the b: a blue Alert card and the d: the decode of the Vigenère cipher. The strings in italics denote cards I was not able to find independent verification of on the web beyond the listing in the Cryptic Message thread on the 2k forums. So it seems that Citizen 13 may not be dead after all - if he is indeed the person who wrote the messages. But it seems like a pretty good bet because I can't imagine that the CSW Headquarters would be giving out messages from some random person pretending to be Citizen 13. During our recent operation in Seattle, Citizen Soldiers uncovered and preserved shocking new evidence of a terrifying new menace. Our analysts and research teams are hard at work, examining the nature and cause of this bizarre death. 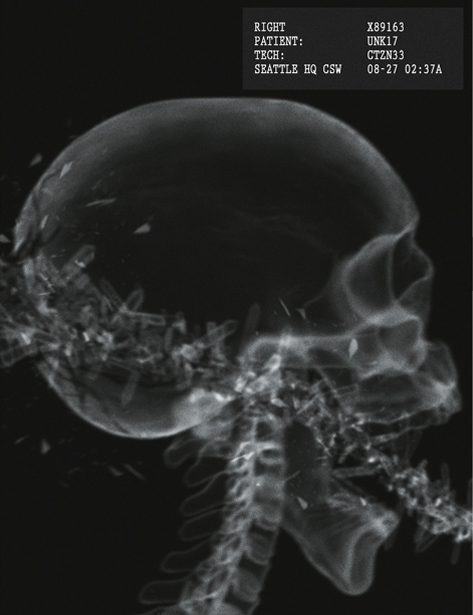 Preliminary evidence suggests a link between the lethal crystalline growth apparently implemented in this attack and the crystal samples uncovered at certain sites of unexplained atmospheric phenomena. Preliminary analysis is chilling, suggesting that a novel and lethal technology of unknown scope lies in the hands of an enemy as yet to be determined. We urge all Citizen Soldiers with experience in ballistics, radiology, biology and chemistry to offer their insights regarding this ominous development. Operation P.A.X. has now concluded in Seattle, Washington. We are still gathering and analyzing all evidence and will be reporting back on everything we have found soon. All documents from Operation P.A.X. have now been added to the Recruitment Docs area on this site for future reference. 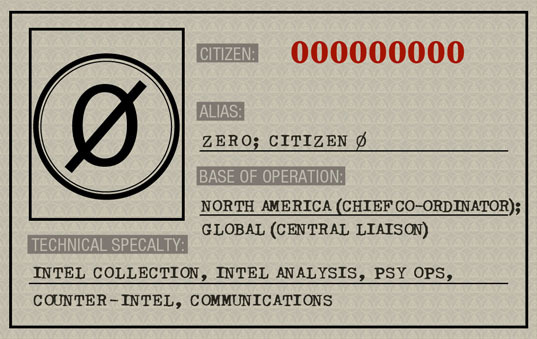 The codes within the cards are currently being catalogued by Citizen Soldiers on our Bulletin Board. As your leader, I encourage all Citizens new and old alike to come together to discuss all evidence you have received and have it verified by the Citizen Elite. I fear that Seattle was just the tip of the iceberg for us - the games have just begun, and we must be ever-ready to face this unknown threat. Evidence has been forwarded from an unknown source has come into the hands of the Citizen Elite. This photograph was allegedly taken in West Washington. Citizen Soldiers, we need your eyes. .---- ...-- .. ... .- .-.. .. ...- . I really hope that Citizen 13 is the one that sent the photo and is not meant to be the alien figure in the picture. 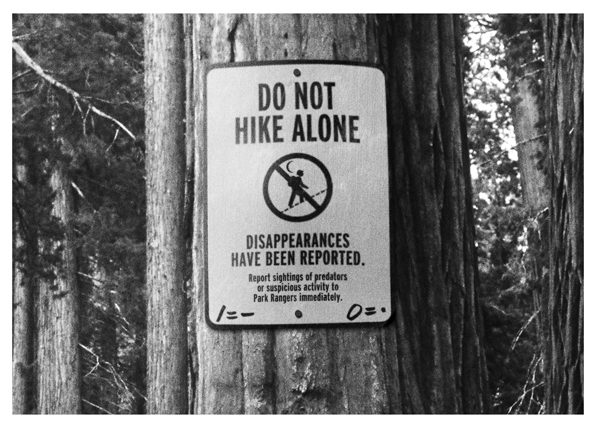 Reports of disappearances in the dense forests of western Washington State correlate with new photographic evidence. This may indicate that our unknown enemy, last sighted in Seattle, may be headed southward. Citizens with knowledge of the photographic evidence's origin are urged to contact headquarters with any further details or conjectures. and aggressive exploration of these areas. in airstrikes or wing defense maneuvers. indicators that weather manipulation was viable. experiment involving Hurricane Daisy (1958). enabled the manipulation of weather events. with sightings of XXXXXXXXXXXXXXXXXXXXXXXXXXX ("XXXXXXs"). potential risk, but further investigation remains vital. 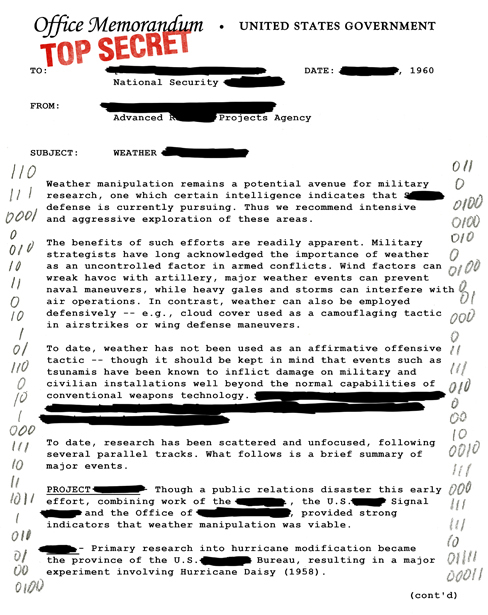 Agents in Western Washington State have intercepted a cache of documents indicating the U.S. government's interest in weather manipulation for military purposes. This is highly suggestive of the nature of recent phenomena, and the identity and motives of at least certain agents of unknown affiliation connected with recent events. However, the derivation and authenticity of these documents have not been fully ascertained.